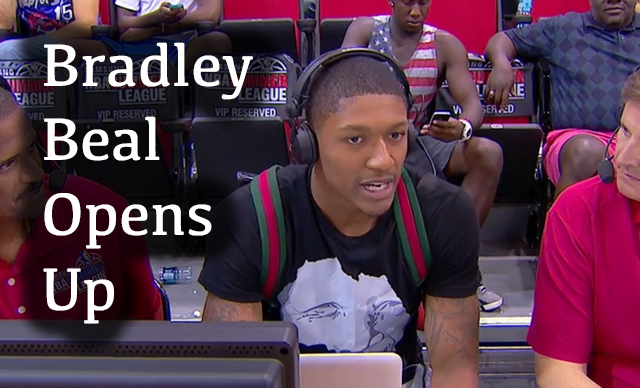 Bradley Beal sat down with NBA TV during the broadcast of the Wizards Summer League "Playoff" game (lol) and talked about all sorts of Wizards stuff. There was a lot of the usual stuff, but Beal, who has been very quiet and quite honestly a pretty boring interview, opened up a little bit and showed some personality. Here are three key nuggets from the interview where Beal showed a little emotion and excitement. When asked about Paul Pierce, Beal said he was excited for the offensive possibilities. The one thing that he really liked about Pierce is that the former Celtic is cocky and isn't afraid to talk trash. Beal even thinks he can learn a thing or two from Pierce about the art of talking smack on the court. When asked about his bigs (Gortat, Nene, Humphries, Blair) Beal lit up. He said he was excited that every single one of them wasn't afraid to bang around inside and push other players around. Beal is specifically impressed with Gortat laying down the Polish Hammer (that is what I call Marcin's finishing move). When asked about the 2013 Team USA Basketball mini-camp that Beal was invited to, Beal had a very somber tone. Unfortunately for Brad he was injured at the time and was unable to participate. Beal said he was so amped and upset that he was "doing things that I wasn't even supposed to be doing" aka risking injury. However, luckily for Wizards fans, Coach K put a stop to that and Beal was good to go in 2014.